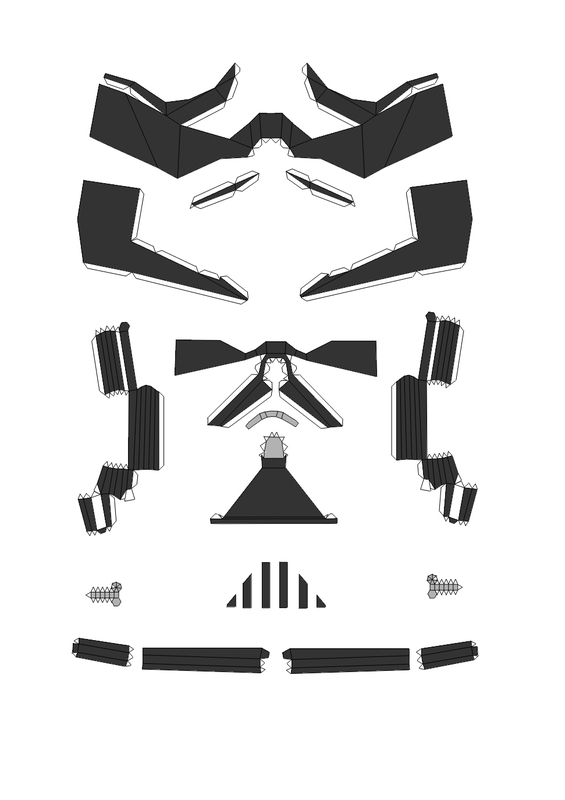 IT's always easier to start with a pattern, so I searched Paper Vader mask, and I found a picture of the print out for a mini Vader mask made out of paper on Google image search. I saved the image to my computer and then zoomed in till it was about the size I wanted and then traced the image onto paper directly from the monitor. 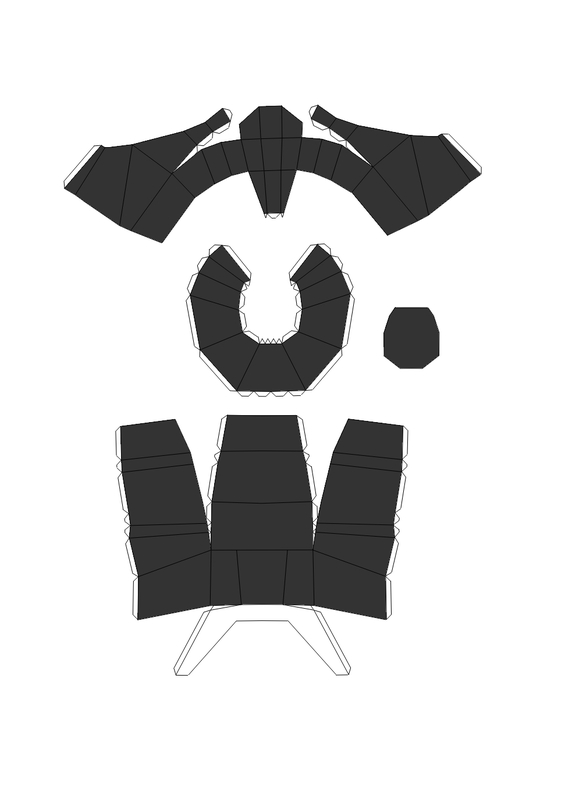 It's hard to make sense of the random shapes, but this top shape is the cheek bones, and the middle piece between the L shaped ones and the triangle is the out side of the mouth. Instead if cutting it all the way out I only cut a slit in on the curved part of the line to give a rounded look to the eyebrow part. Then I folded the "extra" part under on the line so it was the original shape. I heated it and gave it a round shape on a bowl. Then I found a curve going the opposit way to curve it up for the eyebrow-ish part just over his eyes. I cut a few pieces to fill in the gaps on the sides of the mask so I had something to glue the tusks to. Once I got the tusks on I cut them flush with the back edge of the mask. Then I cut out 6 small circles and glued them on each end to cover up the exposed wire. I positioned them in and glued the foam to the foam on the inside. now I went to the eyes, remember the slit that I cut in the eye brow piece. I put glue on the bigger piece then laid the triangle piece on top of it to make the cavity for the eyes. This is the final shape, can you see the upside down triangle drawn in the middle? To get the cross mesh look I scored it with a nail. An x-acto would have cut to far in. You can also use a black ball point pen. I used the pin to do the out line. It defines the lines a little better. I didn't paint the glue over the lines that I scored in the foam because I wanted the extra depth and texture. And I decided not to use the black gloss paint for the mask cause the glue gave it a bit of a gloss. Here are just the pieces that I used from the original pattern. Everything else I had to fill in my self. But this is the cheek bones, and mouth part. Save the image to your computer and print it as large as you can on a 8 1/2 x 11 piece of paper, and it should be about the right size for a child. OR if you need it slightly bigger then zoom in a little and trace it right off the screen. white tissue paper works great for this. Good luck!!! Do you happen to have a pattern of the pieces you used to make the mask? I know you said you wound up only having to cut out some of them on those sheets and not all, if you happen to remember, or better yet have the file still of the re-sized and redrawn pieces that would be incredibly helpful. I said I would attempt this for my son and we were cruising right along until I got to the mask... now I want to go run and hide! You did a really great job! I just commented on the post, but I meant to reply so you would get a notification. updated the post, hope it helps! Thank you! I know that piece is really intimidating. It's a make or break piece for the costume. Let me go through my patterns and see what I can find! ok, Andrea, I unfortunately did not keep my pattern from last year. 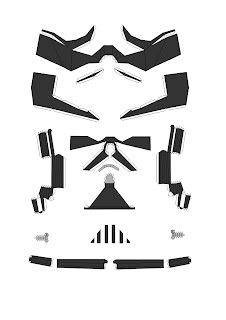 But I did edit the picture of the pattern for the main part of the mask. Try printing that as big as you can on a piece of paper. That should give you a good starting place. I suggest tapping the pattern together first to check size before you cut into your craft foam. Good luck!! And all your help in response to my questions!